Posted on September 25, 2014 at 12:00 pm. 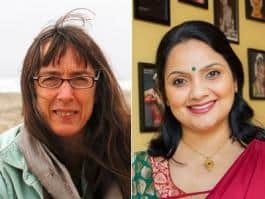 PORTLAND, ORE. – The Regional Arts & Culture Council (RACC) has selected two performing artists to receive this year’s fellowship awards: Linda Austin and Anita Menon. RACC’s fellowship program is designed to help local artists of high merit sustain or enhance their creative process, and each fellowship includes a cash award of $20,000. Linda plans to use the RACC fellowship to take the time to revisit a past work, Three Trick Pony, as well as embark on the creation of a new piece, (Un)Made. Anita Menon founded the Anjali School of Dance in 1996 to impart the ancient art form of Bharatanatyam to students in the Portland area. She has adapted the art form for the next generation of dancers through her innovation and experimentation with contemporary choreographic works including dances on Cinderella, Red Riding Hood, Pegasus and the Wizard of Oz. Anita has choreographed dances using western classical music (such as Beethoven’s 5th symphony) as well as dances blending Bharatanatyam and yoga. In addition, Anita teaches “Story N Motion”—a program that combines the use of Bharatanatyam movements to convey stories, myths and legends from around the world. Anita is the founder of Mai3m, a non-profit organization dedicated to promoting Indian dance, music and culture in a contemporary context through original choreographies, performances and educational outreach. She is also an active volunteer board member of the Cultural Coalition of Washington County and the Hillsboro Arts & Culture Council. With the fellowship, Anita will set aside time for study, further experimentation, research and reflection that will affect both aspects of her choreography, traditional and exploratory. New choreography for her young female dance students and collaborations with other dance forms are intended outcomes. Established in 1999, RACC’s Artists Fellowship Award remains one of the largest and most prestigious grants to individual artists in the Pacific Northwest, supporting exceptional artists who exemplify RACC’s mission of enriching the local community through arts and culture. RACC rotates the disciplines it honors each year—performing arts, visual arts, literature and media arts—and strong support from donors made it possible to award two fellowships in 2014. (Only one fellowship per year was awarded for eight of the last nine years, and no fellowship was awarded in 2009). To be eligible for consideration, professional artists must have worked in their field for 10 years and have lived in the Portland tri-county area for five years. Applications, which include three narrative questions, artist resumes, two letters of recommendation, and examples of the artist’s work, are reviewed through a panel process of community representatives from the discipline being honored. This year’s panelists included Jim McGinn, Kenji Bunch, Maisie Speer, Kimberly Howard, Walter Jaffe, Joaquin Lopez and Kevin Jones. Austin and Menon join a prestigious group of local artists who have been named RACC Fellows in the past, including Mary Oslund, Obo Addy, Christine Bourdette, Terry Toedtemeier, Jim Blashfield, Michele Glazer, Tomas Svoboda, Keith Scales, Judy Cooke, Michael Brophy, Chel White, Craig Lesley, Thara Memory, Henk Pander, Joanna Priestley, Kim Stafford, Robin Lane, Eric Stotik, Lawrence Johnson and Sallie Tisdale. All RACC fellows are listed at http://www.racc.org/grants/individual-artist-fellowships.